« Seafood and Mushroom Salad. Dry Glass noodle 70 grams, soak in water will soft, cut in shorter pieces, drain. Fresh Shiitake Mushroom 8 pieces, clean and cut in small pieces. Onion 1 Piece, peel, clean and cut in small pieces. Tomato 2 Pieces, clean and cut in small pieces. Chinese Celery 2 Pieces, clean and cut in 1 inch long pieces. Garlic 10 small cloves, peel, crush and cut in small pieces. Heat up the oil in the wok. When the oil is warm add the crushed garlic. When the garlic gives the smell add the onion, continue frying for a few minutes until the onion is fried, then add the mushroom and the tomato, season with Soya Sauce. When the Tomato is half cooked add the glass noodle into the wok and stir well, so the glass noodle absorbs the sauce into it. 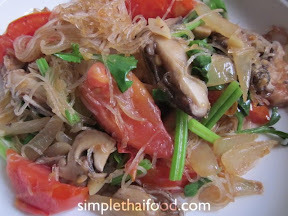 When glass noodle is cooked, add the celery, fry them all together a bit until all is soften and well mixed. Originally I invented this dish with dry Shiitake Mushroom. After making the dish using fresh ones, I realize that dried Shiitake is better. 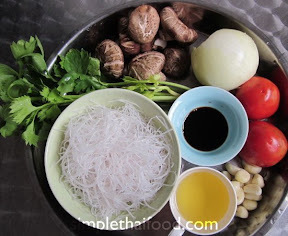 If you want to use the dry Shiitake Mushroom here, first soak them until they are soft, then cut them in small pieces, and finally fry them with garlic and onion before adding Soya Sauce so that the sauce gets into the mushroom. I like the dry ones because they give a stronger Aroma. Thank you for reading this far and Happy cooking!